To offset the tightening of capacity in the transportation industry, a growing number of shippers have been developing real relationships with asset based carriers. Shippers are beginning to move from a traditional lane-based transactional model toward strategies that incorporate dedicated trucking services. Until recently, shippers have enjoyed the economy and flexibility of using the brokerage market to provide the added capacity they require during peak volume periods. Unfortunately, as transportation capacity continues to tighten and rates begin to climb, brokers and owner operators often chase the most profitable freight. If your load doesn’t meet their definition of profitable, it will not make their priority list. Savvy shippers have learned that one of the best options to secure capacity in a tight market is to seek dedicated contract carriage services. In this relationship, the shipper often pays a flat rate per truck per day. 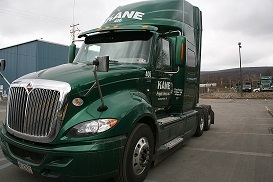 The shipper will dispatch the contracted assets in a way that best utilizes the driver and truck. Shippers can secure trucks for one day, one month, or more depending on their need. Reliable service through guaranteed capacity. A retailer that uses a just-in-time store replenishment strategy can’t afford gaps in service. Avoid service issues with brokered freight. Reliability is tested when you have to reach out to unproven partners. Savings. For companies that need to supplement private fleets, it’s more cost-effective to contract for steady capacity than to buy and maintain more trucks and hire more drivers. Continuity of service. When the same driver shows up day after day, you get better communications, increasing the chance you will get excellent service. When it comes to accessing freight capacity, market forces are swinging the pendulum in the direction of asset-based carriers. With tight capacity likely to remain a reality of the transportation landscape for some time, dedicated contract carriage is not only back in a big way, it’s here to stay. Interested in dedicated contract carriage services? Check out ours.